On March 16, 2007, Isaiah came into the world at 9:41 PM weighing 8 lbs. 6 oz. he was greeted by his daddy, Grandma Lisa, and Great Aunt Chaundra. 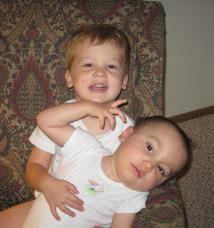 He soon had the pleasure of meeting his older brother, Ethan who, by the way, just turned two in December! He was the picture of health and the star of the nursery! Isaiah came home from the hospital with hand-made blankets, hats, and booties. Although he was very quiet and peaceful in the nursery, he ended up being a very colicky baby and cried for close to four months! Despite his cranky disposition at the time, Matt and I loved him with all of our hearts and he blossomed into a very happy, cuddly baby. Isaiah began developing right on schedule as most babies do. He started to roll over; first one way and then the other. At four months, he could sit up alone long enough to get a good picture by himself. But after five months, he still couldn't sit up any better than at four. And by six, he still needed a decent amount of help and, sometimes he would just fall straight backwards with no warning at all. Also, something that had me puzzled was that he still startled very easily, like a newborn does. Only I had never seen a baby his age that still did that. The doctors just kept saying that babies develop at different rates and pretty much dismissed my concerns. But I wasn't comforted by these simple, generalized answers. I had a gut feeling that just would not quit. I never really mentioned it to anyone too much. To be honest, I was a little ashamed of myself. Everyone thought he was just fine and that I worried too much. It is true, I worry about everything. But this was so different than any other feeling I had ever had before in my life. I could not even believe what I was reading. It wasn't until his next well-check at nine months that my concerns were finally taken seriously. Isaiah's pediatrician referred us to an ophthalmologist because she really thought he had some sort of vision problem. It was at that appointment on December 20 that we found out there could be something seriously wrong with our little boy. The doctor told us Isaiah's retina was white and that meant a metabolic issue. He referred us to a geneticist at Children's Mercy. Two weeks later we got a letter in the mail from the eye doctor with a summary of the appointment to be sent to the pediatrician. It mentioned a cherry red spot and this was new information to us. Still, I had not gotten on the internet to search any of this and I hadn't planned to. I did break down, though, and a couple of hours before our appt. with the geneticist I Googled "cherry red spot on macula of eye". Tay-Sachs popped up immediately and as I read the disease description, my heart sank. Detail for detail, it was like reading a story written specifically about my son. I think what got me the most was the startle reflex part. People were always calling him "jumpy". And then, the life expectancy...2-4 years of age. I could not even believe what I was reading. Shortly after stumbling upon this information, my biggest, worst, and newest fear was confirmed. Our doctor said she was sure he had Tay-Sachs; if not that, then something equally as ugly. So after two hours of questions, crying, and blood work, we headed home to call our friends and family who were all anxiously waiting to hear what the doctor had to tell us. No one could ever have imagined it could be this bad. But we did not fall to pieces. Instead, we have all come together to support one another and to lift Isaiah up to the Lord to be touched by our God. Isaiah was sent to this earth for a divine purpose. We are all praying for a miracle, but if we have to say goodbye to our little angel, we will all be better people for having him in our lives. Isaiah has spread the Word of God to hundreds of people all over the world already in his short little life. He isn't finished yet, though! He will continue to touch people's lives until the day he is called Home! For more information, please visit www.caringbridge.org/visit/isaiahproject.